Continuous waves of people have flocked to this land. Inhabited for thousands of years by hunter-gatherer peoples, the first group of technologically advanced migrants arrived from across the Limpopo in what we today call the Bantu migration. Starting around 3000 BC around the modern-day border of Nigeria and Cameroon, a sedentary people with advanced technology – agriculture and bronze-working – began to move east and south, amalgamating with or simply displacing the hunter-gatherer peoples they found on their way south, eventually crossing the Limpopo somewhere around 300 AD. (We know this from using ethno-linguistic evidence: tracing the origins of the Bantu languages we find one common ancestor in in south east Nigeria.) The Bantu used two major routes to the south: starting in Nigeria, one traveled directly south, through the tropical rainforests of central Africa. The other traveled east first, around the forests, through the plains of modern-day Kenya and Tanzania and then south into South Africa. Arthur Blouin, a PhD candidate in Economics at Warwick University, use these two routes to test Jared Diamond’s hypothesis that climate influences technological adoption. He finds that these travel routes still matter today; the descendants of Bantu migrants that traveled through the rainforest (and thus lost their superior agricultural technologies) are less able to adopt new technologies today (yes, more than two millennia later) than those that traveled around the forests (and thus maintained their better technologies). The Bantu migrants settled most of southern Africa, except for most of the desert-like region on South Africa’s north-western shore (which is why a few Kalahari San people still remain, pushed to survive in these extreme environments) and the plush south-western Cape, where the Mediterranean climate was unsuitable to the summer-rainfall crops of the Bantu. This meant that when Dutch settlers arrived in the mid-seventeenth century, the only peoples they encountered were the Khoe (descendants of Botswana San who had long before adopted cattle farming and migrated south) and the San (the original hunter-gatherer’s at the Cape). They became collectively known as the Khoesan (or Khoisan). The Dutch arrived not to colonise but to control the route to the East Indies, where precious spices could secure huge profits for the shareholders of the East India Company. A small fort was constructed in Table Bay, but it was soon realised that the Khoesan could (or would) not provide enough cattle to supply the passing ships, and so a few company workers were released to become free farmers, the start of the process of colonial expansion. Not all of them were equally good farmers, though, and as Dieter von Fintel and I show, the Huguenots were more productive wine farmers than the rest. It was the Khoesan that suffered the most from the colonial expansion; by the end of the eighteenth century, descendants of European immigrants had settled most of their territory; those that did not perish from disease or skirmish could either flee (to the north, as many did) or accept their fate as labourers on the settler farms. They weren’t the only labourers on these farms, though. From early, Cape officials had begun importing slave labour, most of whom arrived from the Indian Ocean regions of Indonesia, India, Malaysia, Madagascar, Sri Lanka and the East African coast. 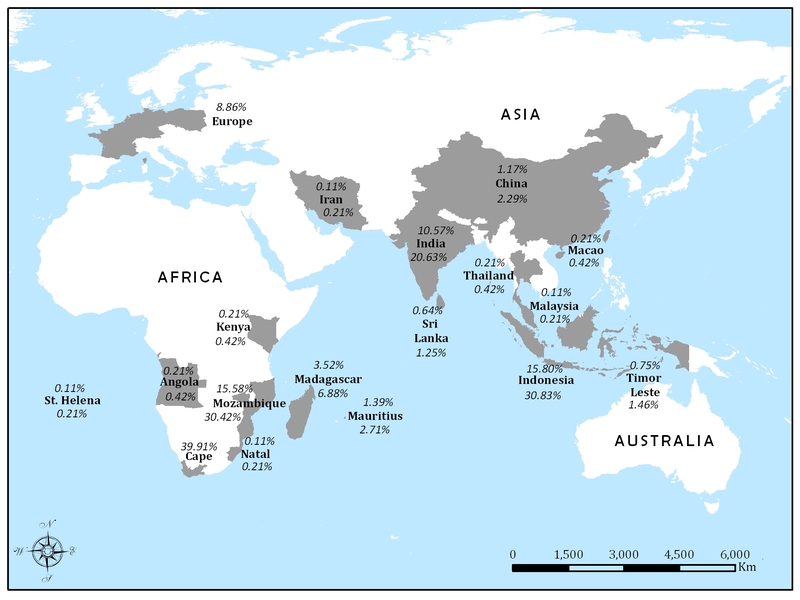 The image above, from my paper with Joerg Baten, shows the regions where the slaves came from (at least in our data set). Not only were settlers moving east (augmented by about 5000 British settlers in 1820), but the Mfecane forced many groups to move west, away from the powerful and violent Zulu kingdom of Shaka on the coast and, in the interior, Mzilikazi’s Matabeles. Some estimates have it that up to 2 million people died in these tribal conflicts. This depopulation of large parts of South Africa made the journey of a few thousand settlers across the Orange River possible, a migration now known as the Great Trek. By 1840, very few South Africans (black and white) had been born in the same district (or country) they were then living. The settlement of Afrikaners and subsequently British settlers in fertile Zululand meant that tropical crops like sugar could be produced. Yet sugar required large-scale labour, and even though Zulu labour could be found, the sudden discovery of diamonds in and around Kimberley meant that wages were at a premium. Instead, Indian indentured labourers were imported, and in vast numbers. 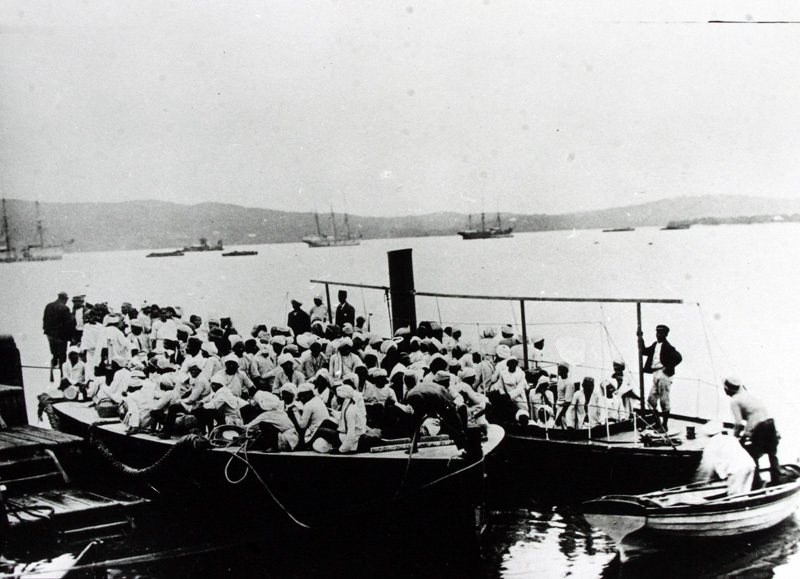 More than 150 000 Indian labourers arrived by ship between 1867 and 1902 to work on the plantations. After the discovery of gold in the 1880s in the Witwatersrand, and the Second South African war which disrupted the labour flows of black workers to the mines, close to a 100 000 Chinese labourers also arrived at the start of the twentieth century, although most returned to China a few years later. European and African migrants continued to move to South Africa throughout the nineteenth and twentieth centuries in search of employment (on the mines) and a higher quality of life. And they still do: close to 5% of South Africa’s population today, according to official statistics, are immigrants. (This Nando’s ad sums it up pretty well.) Yet the benefits and costs of migration are fuzzy: Paul Collier writes in a contentious new book – Exodus – that migration is good (as most economists would agree), but that too much of it will be bad (both for the host country and country-of-origin). This is the best review I’ve read. His most important contribution, I think, is in rephrasing the question: instead of asking whether immigration is good or bad, we should rather be interested in how much more migration would be beneficial, and to whom? Over the next two days, economic historians in South Africa will discuss these question at the 10th ERSA Economic History workshop (hosted by North West University, Potchefstroom campus). Immigration is likely to become an even more perplexing political topic in South Africa over the next decade. It’s best we understand its impact on our past.